The Black & Tan Club: 404 1/2 12th Ave. S. Seattle’s most esteemed and longest-lived jazz nightclub operated from 1922–1966 under various names, and was the backdrop to greats like Duke Ellington, Ray Charles, and Charlie Parker. Singer Ivie Anderson performed there every time she came to town with... Duke Ellington? She also jammed with some of my family members who frequented the place. Also, Don Osias (Hammond B-3 player from the Playboys and many other NW bands), performed there, too. who played guitar with The George Griffin Trio at The Black & Tan Club in Seattle in the early 60's. "The first time I went to The Black & Tan club just off Jackson on 12th Ave (in 1963), a friend and fellow musician Anthony Atherton, tenor sax player, took me there. We entered the club down a big long flight of stairs with a landing halfway down - so it was the equivalent of going 2 stories below street level. When we walked through the double doors into the club, directly in front of us was a big picture (approximately 3' x 2') of Alex Palmer, club owner and Joe Lewis, the boxer. The Dave Lewis organ trio was playing & on the show (there were 2 nightly) was Guitar Shorty, who I found out later was Jimi Hendrix's uncle. Shorty was and still is a great blues player. His act was amazing. He had the longest guitar cord I'd ever seen, maybe 50 ft long & was doing somersaults & back flips all the time playing guitar leads. His act was mesmerizing - easy to see where Hendrix got some of his ideas for his act. Shorty played with his teeth and made the guitar say cuss words - it was a truly mind-blowing experience. The Black & Tan was a bottle club (BYOB) that had food & "set-ups" for the bottle that the ladies had in their purses & the men had on the inside pocket of their suit coats or dinner jackets in a bottle or flask. There were packed houses most nights as the club would get the overflow from nightclubs that shut down at 2:00 a.m. as many folks were just getting started or at least not willing to quit listening or dancing to music and having fun. There was relatively little trouble as most people were there for the exceptionally good music and to have a great time. Name acts that were playing concerts or clubs in Seattle would come and sit in with the band; members of Ray Charles' band, Joe Sample, and Sticks Hooper from the Jazz Crusaders. 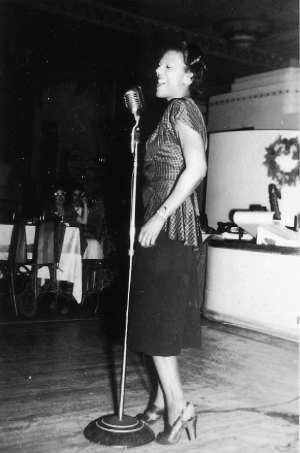 Carmen McCray came in after her gig at the PentHouse to hear Etta Jones as they were good friends. Hampton Hawes came to listen one night and partied 'til dawn with the band well past day-break the following morning, drinking bourbon and talking trash." Webmaster Note: It was reported by a family member of Jimi Hendrix that Guitar Shorty was not related Jimi. The thought that Jimi's act may have been influenced by Guitar Shorty was apparently speculation on the part of the writer. Lee Parker's remembrances were received after his passing and as such the Webmaster was unable to obtain clarification directly from Lee.